David Swerdlow was born in Brooklyn, New York. He has had a life-long interest in photography and studied in a technical commercial photography program during high school. He then attended the University of California and Harvard Medical School. David has traveled extensively and has always tried to capture the essence of the people and places he has visited through his photographs. David has two grown daughters and recently relocated with his wife from Atlanta to Phoenixville, Pennsylvania, outside Philadelphia. The family spends part of every summer in Italy. He enjoys shooting Italian landscapes as well as nature, especially birds, flowers and insects. His photographs have been published in Wine Spectator Magazine, Petersen’s Photographic, the New England Journal of Medicine, and Emerging Infectious Diseases (cover photograph). He photographed 2,500 year-old Etruscan artifacts for the "Museo Civico Archeologico e della Collegiata" in Casole d'Elsa, Tuscany for a published book called "The Bargagli Collection"(including cover photograph). His work has been shown in galleries in Long Island, New York, San Francisco, Atlanta, and Italy. 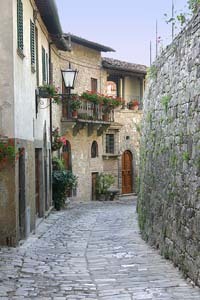 Over the past few years David has had over 15 exhibitions in Atlanta and Italy featuring his Images of Tuscany. David’s photographs are largely representational. He seeks to convey a feeling of serenity through his subjects and presentation. For his gallery exhibitions he and his wife, Lyn Finelli, present the photographs in specially-designed decorative frames that enhance the image and give a finished custom-framed appearance to the work. This beautifully-designed art work will remind you of the beauty of nature and Tuscany every day. In addition photographs can be printed and stretched on canvas to create a true painting-like feel. All photographs are available for purchase as prints or framed and all matting and framing materials are acid free. Speedlight 420 EX flash and the MR-14EX macro flash.